As a retired plumber and mechanic, Bobby J., 69, of Takoma Park, MD, is no stranger to figuring out how things work. So when he had the chance to learn more about online banking and how to manage his finances right from his phone or computer, he jumped at the opportunity. "Some people are set in their ways, but I try to stay current and adapt," Bobby said. Online banking adoption in the U.S. is on the rise, but according to a 2016 Federal Reserve Board report, only 18% of adults over 60 use online banking. Ready, Set, Bank is an online-based course that gives people everywhere the tools and confidence they need to start banking online. The videos guide learners through every step of the process, with overviews and step-by-step tutorials to help them manage their finances electronically. Victory Tower, an affordable housing development for seniors, hosted the class in their computer lab for a group of its residents, including Bobby. "After the first three courses, I really grasped it – I realized online banking is easy to do," Bobby said. 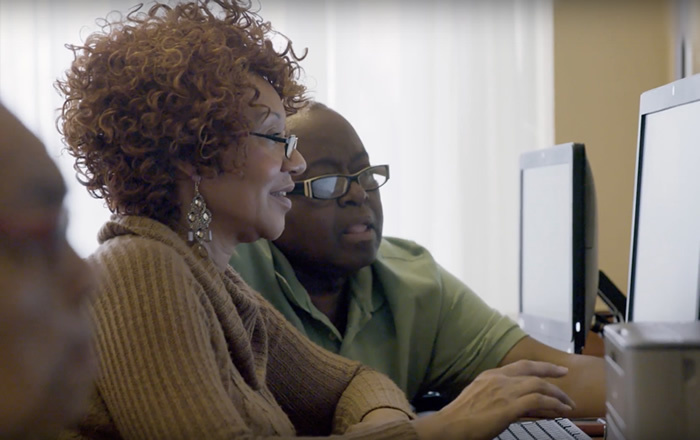 For Bobby, Ready, Set, Bank was not only about learning new skills and keeping current with technology, but it made him feel more relaxed with his money. He said feels safer paying his rent and bills online without going to a branch at night or during bad weather. And that he has peace of mind knowing he can manage his accounts when he is out of town, potentially avoiding late fees. "I have less to worry about," Bobby said. Ready, Set, Bank is part of Capital One's Future Edge initiative to help more people gain skills to succeed in the 21st century. Since the course launched in 2016, it has helped thousands of people like Bobby learn more about online banking. That knowledge and confidence not only helps individuals, but can get passed along through the community, as Bobby can attest. "I try to get more people to take Ready, Set, Bank," Bobby said, adding that he offers his help if they don't get it or are confused. "It's easy to sit with a friend to show them how things work."